Leaving Key West during one of its brief and infrequent rain showers somehow makes it more bearable. I had been filling out an application at a local hair-braiding and bead tent before the rain started. But now I’ve resigned myself to returning to Maine, the cold weather and the need to wear socks which I’ve been able to avoid for the last six days. Further easing my transition is a four hour layover which gives me the time to pore over pictures and recount the good time had in the Sunshine State. We arrived late afternoon, we unpacked our sunblock, leapt into the pool and wandered out every now and again to sip a pina colada or read. 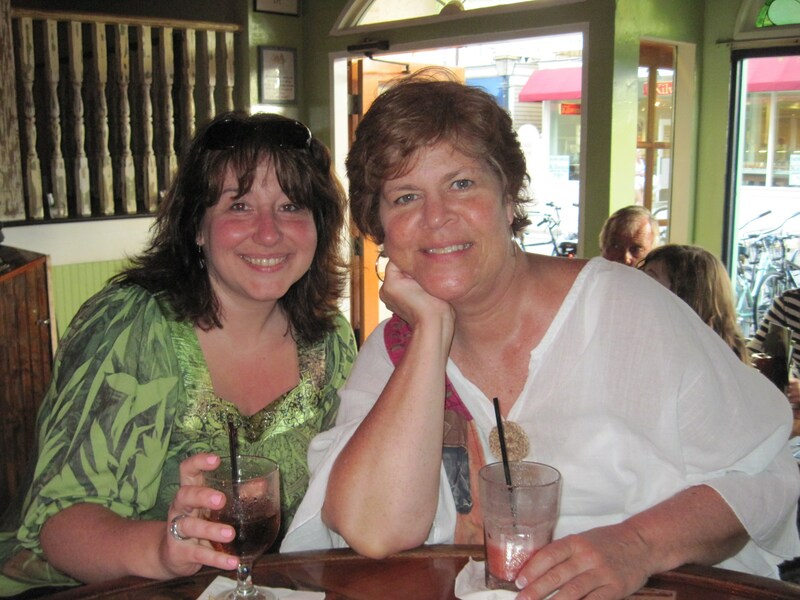 Altogether a lovely first day in Key West. Sunday was jam-packed with trying to learn our way around the city without getting run down by staggering spring breakers or run over by Harley Davidsons. Did I mention that our vacation coincided not only with spring break (which we knew, but couldn’t really avoid if we wanted to get out of Maine in March), but also Key West Bike Week (which we didn’t know and might have avoided, but turned out to be a ton of fun between the people we met and the people-watching opportunities.) We walked up and down Duval St. a few times and made plans for the next few days. Every once in a while, we stopped off to rest our feet like when we snapped this picture at Jimmy Buffet’s Margaritaville. Having spent the prior day mapping out the sites we wanted to see, we got started Monday by taking the hotel bus downtown and having lunch at Kelly’s. This restaurant used to be owned by Kelly McGillis from Top Gun and had great food! We wandered down to the Little White House which – to be honest – I didn’t even know existed until this trip. Apparently Truman spent tons of time here during his presidency, and it had quite a bit of memorabilia which was fun for some history buffs to read about. Our one misstep of the day occurred on our way to the Hemingway House. My friend Sue is a big fan of Ernest and while I’m not as much of a fan I certainly respect his work and was looking forward to seeing his home. The problem started when we read the map. 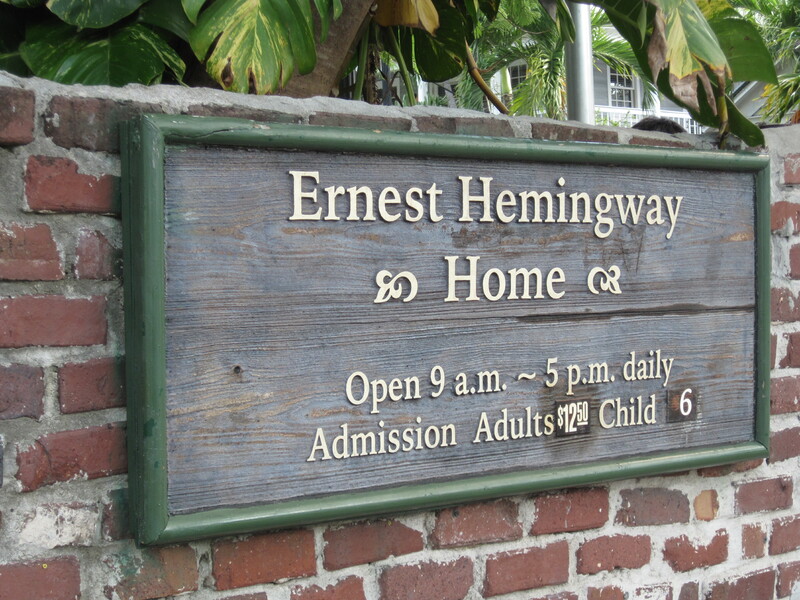 The Hemingway House is 6 blocks from where we started. Not that far, right? Well, not that far except that the blocks are quite long and we stopped off at every shop along the way to search for souvenirs. There also may have been a beverage stop along the way… To make a long story short, 6 blocks turned out to be a little over a mile, plus we spent at least 1/2 hour chatting with a lovely jewelry store owner (and walked away with a few souvenirs for ourselves), before finally arriving at the Hemingway House at 4:47pm. You can see when it closes from the one and only picture I took from the Hemingway House. 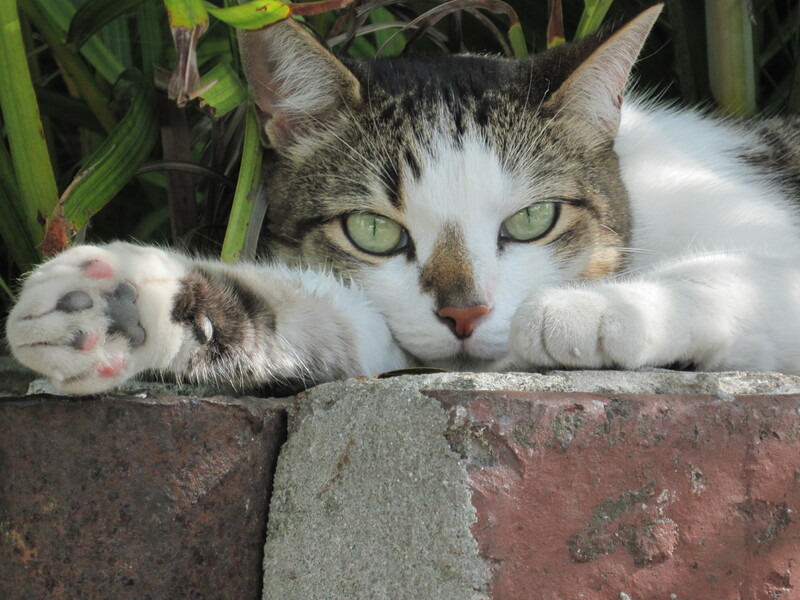 Even the cat we met didn’t have the good grace to be polydactyl. He was very kind as to show me his paw upon request, though. I think he gets asked that question a lot. As I stated before, our trip hit in the middle of spring break. 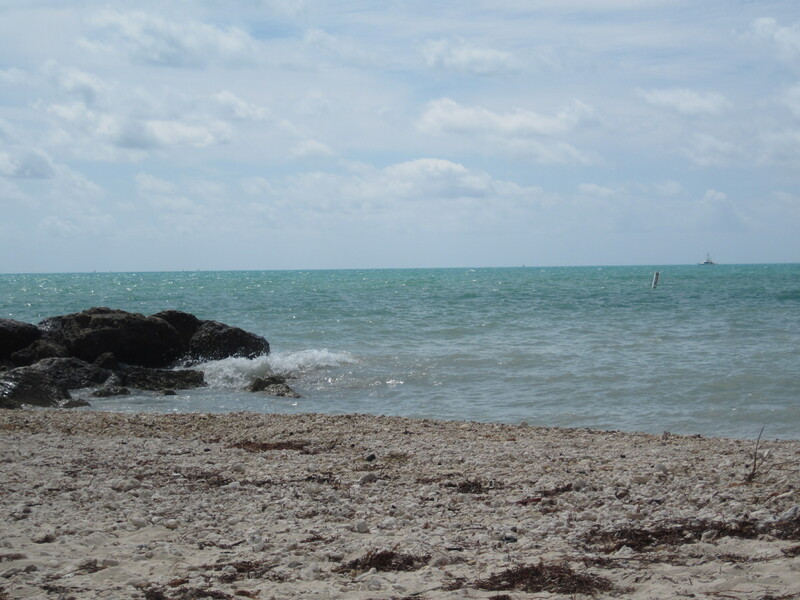 While not one of the spring break mentality even back in the day when I could have passed for a spring breaker, our hotel concierge told us about a gorgeous beach in the middle of Fort Zachary Taylor State Park. She was right – the beach was lovely! The only problem was the fact that all beaches on Key West are man made. And by man made I mean that all beaches are created from the sharpest, most painful rocks, shells and coral they could find that you need to walk over to reach the ocean. Once you got in the water, life was good, but getting there was like walking over hot coals. After spending most of the day getting fried and then crying over our feet, we spent the evening at the hotel pool for a refreshing dip that we didn’t have to work quite so hard for. We got up extra early on Wednesday to take a trolley tour of the city where we hopped off at almost every location to see the sites we couldn’t reach by foot. The afternoon was our snorkeling tour where about 80 folks got on a catamaran, sailed 8 miles out into the ocean and snorkeled on a coral reef for about an hour. We saw some great fish and had fun on the boat, but even though I consider myself a pretty strong swimmer I was a little nervous at how rough the sea was. I was ready to head back to the boat when they called us in. 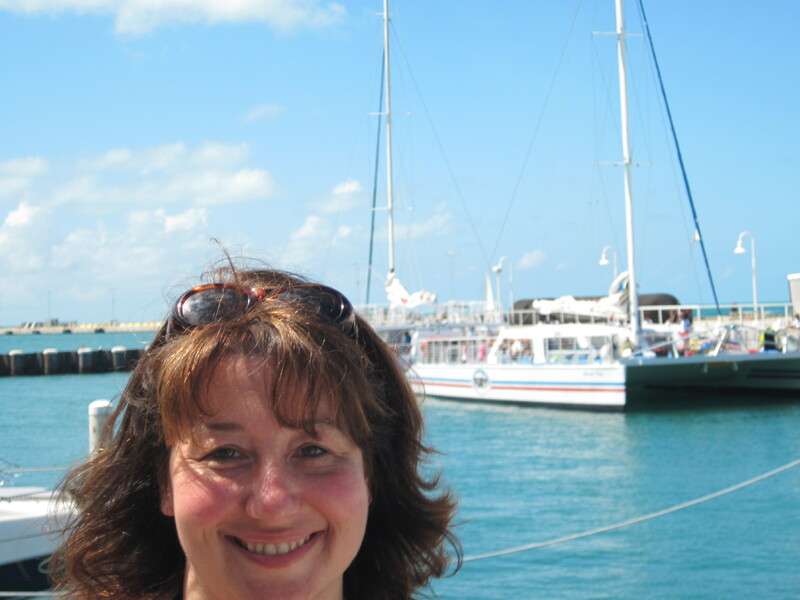 One of the most interesting parts of this day was the game we played called, “Just How Big can Laura’s Hair Get?” Apparently when you add salt air, salt water, a fast boat, humid climate and a touch of rain, my hair will blow up to frightening proportions. There are no pictures of the “After” as they were all *ahem* accidentally destroyed. If you’ve seen the episode of Friends where Monica went to Jamaica, that’s all you need to know. We decided that our last full day in Key West would be spent repeating whichever activities we’d enjoyed most from the prior five. Therefore, we spent a leisurely day by the pool reading trashy novels, gussied up for a night on the town and ate dinner at Margaritaville. Before catching the final bus back to the hotel, we made one final stop at the Key West Key Lime Pie Company!